DJing accessories firm MasterSounds has teamed up with Union Audio to create a new two-channel analogue rotary DJ mixer called the Radius 2. The Radius 2 promises a clean, open and dynamic sound on both Line and RIAA inputs, as well as great usability. It features VU meters, a responsive Master EQ/Isolator, a high-pass filter on each channel, and an AUX send/Return system for easy integration of external effects. Union Audio is the company of none other than renowned engineer and ex-head designer at Allen & Heath, Andy Rigby-Jones. His more recent work includes launching the PLAYdifferently Model 1 DJ production mixer with Richie Hawtin. 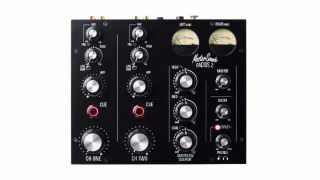 Andy had this to say on the new product: "The heart of the Radius 2 is a carefully designed audio signal path, marrying classic analogue circuitry to the latest high performance components and design techniques, all of which contribute to the superb transparency of the mixer. "The main focus was on accuracy of audio reproduction, with minimal distortion, low noise floor and high headroom, aided by only using components of fine quality". MasterSounds' Ryan Shaw adds: "I deal with customers on a daily basis who are interested in audio upgrades, and central to the setup is usually a rotary mixer. Going back to the '70s and the original disco era, DJs like Larry Levan of the Paradise Garage were obsessed with sound; Larry's music choice was to play disco through a rotary mixer and a great sound system. Now people want to play their records as the original DJs did back in the '70s as there is something purer about mixing without using faders." Each Radius 2 mixer will be hand built, tested and shipped by Andy himself, with prices starting at £1,200 (including VAT) for the standard version, and £1,350 (including VAT) for the premium version. Both will be available in black and silver colour options. More information can be found on the MasterSounds and Union Audio websites.